1MB is a free and easy static website host. 1MB is a free website host designed to make web development feel more approachable. You do not need to browse through complicated settings menus or juggle a bunch of server credentials here. You can edit your site directly inside your browser. 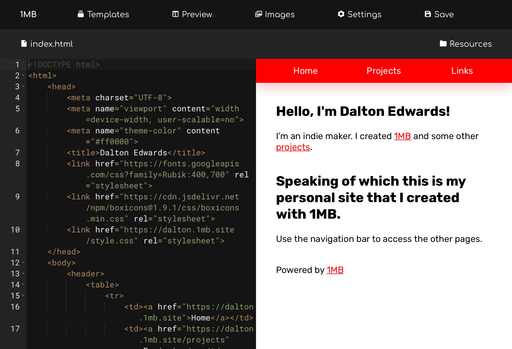 1MB has a custom code editor with some useful features such as starter templates, live site previews, and themes. 1MB gets you online fast by letting you focus on coding. Custom domains and SSL are free! Adding a custom domain to your account is a quick process. SSL is automatically installed and renewed through Let's Encrypt completely free of charge. The best way to protect your website visitor's personal information and show you mean business. You can also deploy to your site using the API: Click here to read the API documentation.